This simple, fresh dessert is ideal for entertaining as it’s best made the day before serving and refrigerated overnight. Pour the Muscat wine and 300ml of cold water into a small pan, then add the sugar, strips of orange zest and vanilla pod. Gently simmer until the sugar is dissolved. Carefully add the peaches. Poach the peaches very gently for 7-10 minutes, until tender when pierced with a sharp knife. Remove the peaches from the syrup and when cool enough to handle, carefully peel away the skin. Return the peeled peaches to the poaching syrup and allow to cool completely. Chill until ready to serve. 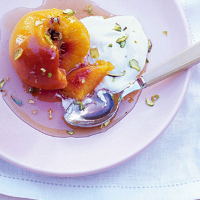 Serve the peaches in their syrup with a spoonful of thick Greek yogurt and a sprinkle of pistachios. As you’ve already bought this dessert wine to use in the recipe, it would be churlish to suggest buying something else to drink with it when this works so well. Ripe grape and apricot aromas, followed by citrus flavours, shine against the sweetness of the dessert.